A week before attending Finovate Fall I had an inspiring conversation with a bank COO that for anyone like me, and any company like Finxact, highlights the importance of our mission to help banks become more agile. The bank COO said to me, “why should I go to Finovate? My current core banking system won’t let me do anything with all that new technology anyway”. Instead of seeing a sales opportunity, I was genuinely empathetic to this banking executive, because I hear it over and over. So I attended the conference as I know first-hand that there is a better, more agile future for this COO. The freedom for this COO and others just like him lies in modern architectures that allow banks to freely and cost effectively tap into this innovation. The promise and fears of AI mirror the space race of the cold war era. Somewhere in between promise and fear lies the reality of smart algorithms today – and intelligent beings that put human kind at risk in the future. For banks there is no question that AI is driving better underwriting, intelligent cash management (for consumers and businesses), and more intelligent customer experiences. The ingredients to moving AI forward lies in an agile architecture that leverages big-data and algorithmic configuration. An offshoot of the first trend is Chatbots. There were many Alexa demonstrations. Someday in the near future we will look back at these clunky demonstrations as simply being a technology looking for a solution. The trend at Finovate was not so much the chatbot, but the promise of AI and BigData in conversational experiences. Add into this an emotional intelligence piece and now the acceleration of mobile banking seems quaint. 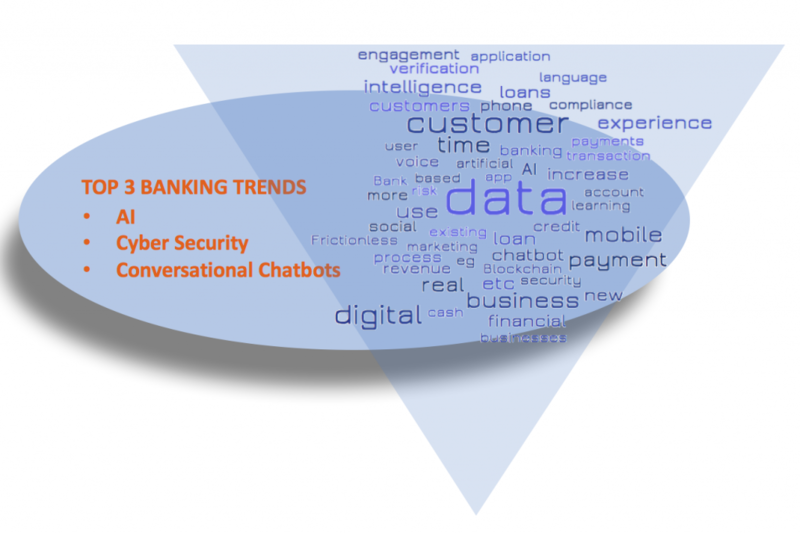 Of course, the architecture, data, and real-time computational power of intelligent algorithms must be built into bank’s core systems to fully leverage the power of AI driven conversational chatbots. Finovate Fall kicked-off on the dawn of a new reality brought to us by Equifax and the largest consumer breach in history. So it is no surprise that Cybersecurity was at the forefront of many company’s presentations. In some cases I saw security being enhanced with blockchain for better/cheaper/faster/safer identity in account origination or transaction security and fraud detection. In other instances, I heard futuristic use cases around utilizing AI to understand a consumer’s emotions as part of multi-part authentication. As I think about the big data and computational power required for even the current use cases, it makes a clear case for agile architectures sitting in the lowest cost stacks of the public cloud. We are at a point in time when no longer is security, customer experience, and real-time digital banking, the most important trends. They are table-stakes that require modern architectures to support immediate innovations like Big Data driven AI – and prepare for an unknown future. Trends are history when we think about it, and competition is just a benchmark. Bad actors, unknown disrupters, societal shifts – these are the drivers that remind us the time has come for more agile architectures and platforms to support our most important societal institutions – like banking.